After a big family meal, you may not be looking forward to slaving over a sink full of dirty dishes. This is why a dishwasher comes in handy. Dishwashers are a great alternative to cleaning your dishes so you can take more time to relax. However, if your dishwasher isn't clean, your dishes aren't going to be as clean as you think. If you have a manual-clean filter, which is present on most newer machines, this step is vital. The filter takes the place of the grinder that's on self-cleaning dishwashers which pulverizes food scraps that go down the drain. The newer manual filter is a quieter process. Although quiet is nice, this alternative process means more food scraps get stuck in the filter and lead to foul smells. Once a week, pull out the bottom rack and remove your filter system. You may notice it consists of many interlocking parts. Usually, there will be a center cylinder that unscrews so you can take the system out. Clean each part individually. Use the sink faucet sprayer, or even a sponge so that you can get any small particles off the parts. Unfortunately, your dishwasher can't stay sparkling new forever. Over time, you will notice discoloration on the interior, even more so if you have hard water. Odors are also bound to occur since you have dirty dishes in there and particles get stuck on parts and in crevices. White vinegar can tackle through both issues. To use vinegar, grab a clean bowl and add a couple of cups of vinegar on the center of the bottom rack of the dishwasher. Now run the dishwasher through a regular cycle without any detergent. Putting vinegar through this cycle will promote a sanitized and deodorized dishwasher. Another way to clean the interior of your dishwasher is with calcium, lime and rust remover (CLR). Using CLR can tackle clogs and buildup. Not only does CLR liquid work to clean, but you can also run it through the dishwasher if you're experiencing any problems before calling a professional. To use CLR, remove your dishwashing rinse agent and put a half of a cup of CLR liquid in the bottom of your empty dishwasher. Leave racks in the dishwasher, but be sure to remove any dishes or glassware. 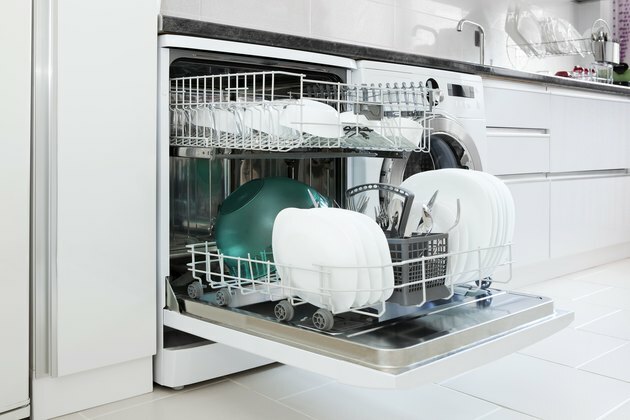 Turn your dishwasher on and run it through a normal cycle with an extra rinse cycle. Be sure never to add chemicals or detergents while using CLR in your dishwasher. As you're cleaning your dishwasher, don't forget about the armholes as particles can get trapped there. Sometimes running vinegar through can help, but it doesn't always tackle debris buildup. A trick is to gather some sturdy wire, like the kind you use to hang things on the wall. This wire will help you remove any buildup in the armholes. You can also use the wire to tackle the utensil holder and racks if there is any debris left on them after running your dishwasher through a cycle with vinegar or CLR. Can You Add Drain Cleaner to a Dishwasher?